Team Raptivity is back with a brand new interaction “Rapid Check” which is a part of the Raptivity Evolve started this year for our valued customers. We encourage you to view the special webcast hosted on the website to gather more information about Rapid Check interaction. During the webcast, Janhavi Padture, Vice President, Strategy and Business Development of Harbinger Knowledge Products unveils the new interaction and share her inputs on the workings of Rapid Check. “A static question with a mix of correct and incorrect options moving in quick succession, that the learner has to accurately identify, forms the basis of this interaction and hence called Rapid Check” says Janhavi. This interaction would allow course developers to quickly check and assess a learner's understanding of a particular concept using fun exercise which is nothing less than a game. The gaming element in this interaction is that course developers can even make this a time bound exercise for the learners’. Mathematics formulas where students are puzzled seeing similar looking alternatives or confusing options. But, they have to be alert and try to recall the right answer. Rapid Check interaction is good not only for teaching difficult formulas but identifying and recalling processes or people as well. The customizability feature of this interaction is what makes it powerful and suitable for use across all segments of learners, from K-12 to college and corporate. Undoubtedly, Rapid Check overcomes the challenges of online and mobile learning as it helps to improve retention and increase attention span of the learners. ‘Reinforce learning through repetition and/or elimination’ is very well showcased through many more interesting examples in this webcast which bring out varied fascinating and intelligent features of Rapid Check interaction. Janhavi also shares some tips and tricks on how to best use this interaction in different contexts. So, hurry to watch the webcast and make the best of Raptivity interactions. Team Raptivity also encourages you to share new ideas on the community ‘InteractivityHub’ for future interactions you would like to see in the series to come. 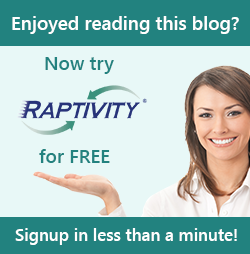 Please let us know your thoughts and suggestions at info@raptivity.com .